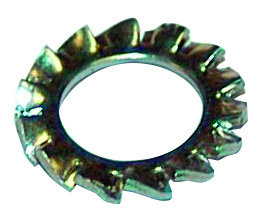 Flat drag washers with overlapping teeth. Manufactured by « Cutting ». In treated carbon steel XC 60 to XC 75.Hardness: between 400 and 480 HV after treatment. White galvanized steel. DIN 6798A – NF 27624.